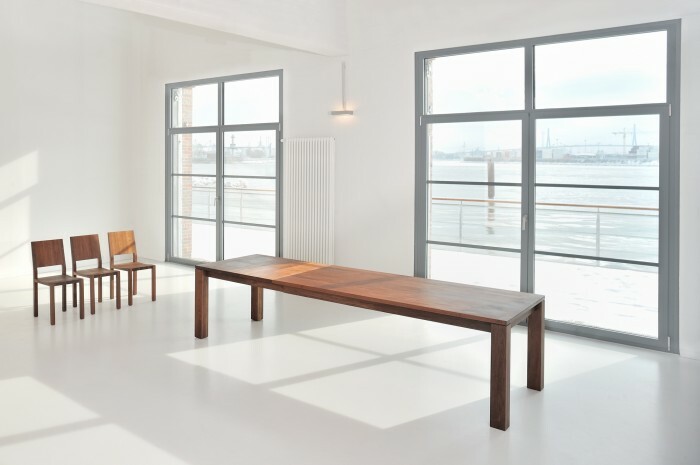 As a basis the table can be supplied in ten lengths from 140 to 300 cm and three possible widths. Thanks to the Butterfly pull-out system the table can be easily extended with playful lightness and in just one swift move up to 117 cm. With one or two folding butterfly leafs hidden in the table with only one-handed operation technology the table can reach a maximum length of 417 cm. With all these changes the table legs always remain at the outer edges and consequently they do not change anything of the timeless forms of this pull-out table. Spacious legroom is ensured in every position. Table LIVING now fits perfectly into any room. Another advantage of this smart giant is the possibility of its complete disassembly for transport purposes – thanks to this a generous dining and conference table can also be transported through narrow staircases. The LIVING model can be supplied in the following wood types: European ash, knotted oak, ash, beech, core beech, American walnut, and cherrywood. For more information, please visit http://www.vitamin-design.de.